These are sketches of the Chinese style of architecture which has evolved over many centuries in China and East Asia. "Articulation" and bilateral symmetry are significant features of this style of architecture. 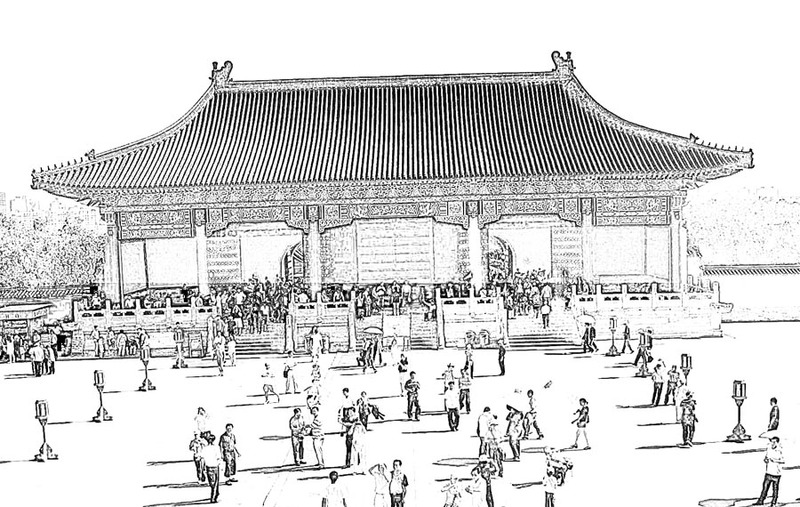 All of the sketches in this post are of the Forbidden City in Beijing, China. Some are simple line drawings, other black and white shaded illustrations. 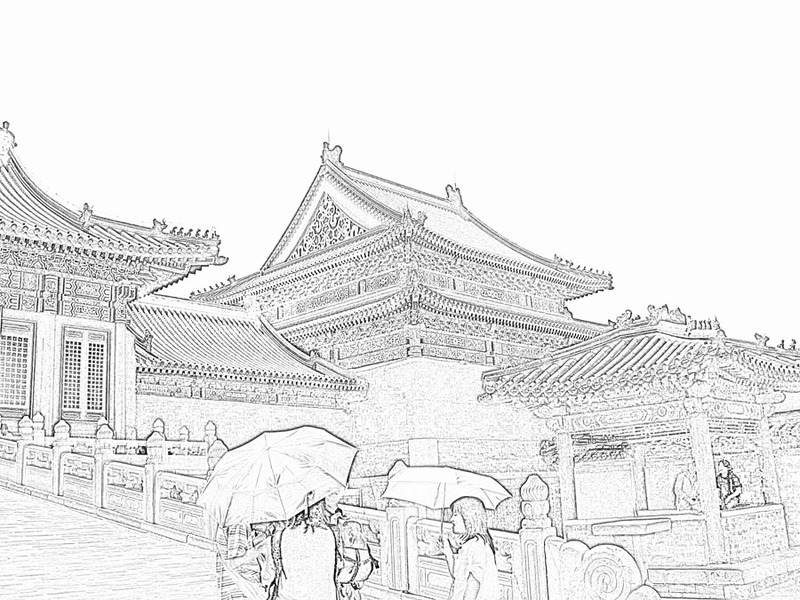 The detailed illustration bring out the intricate decorations that are a part and parcel of many classical buildings in China. Many temples and palaces have large curved roofs, typical of sacred buildings and also some homes of the rich may have this style. 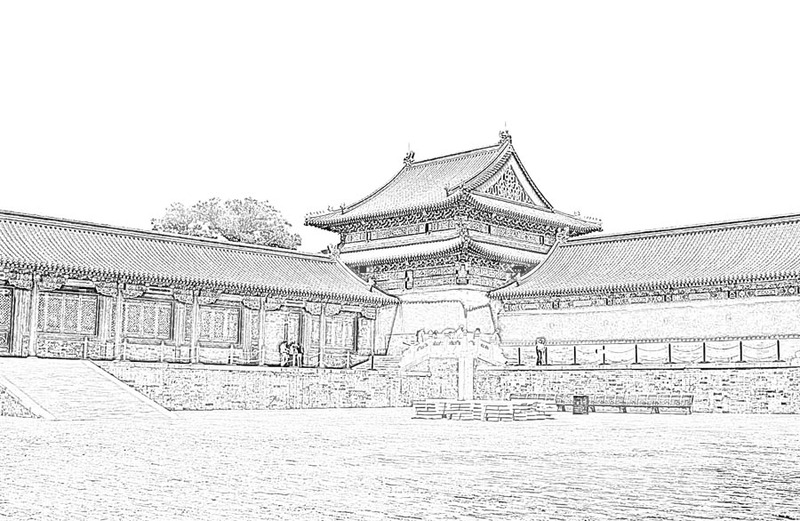 This building sketch is part of the Chinese Imperial Palace. 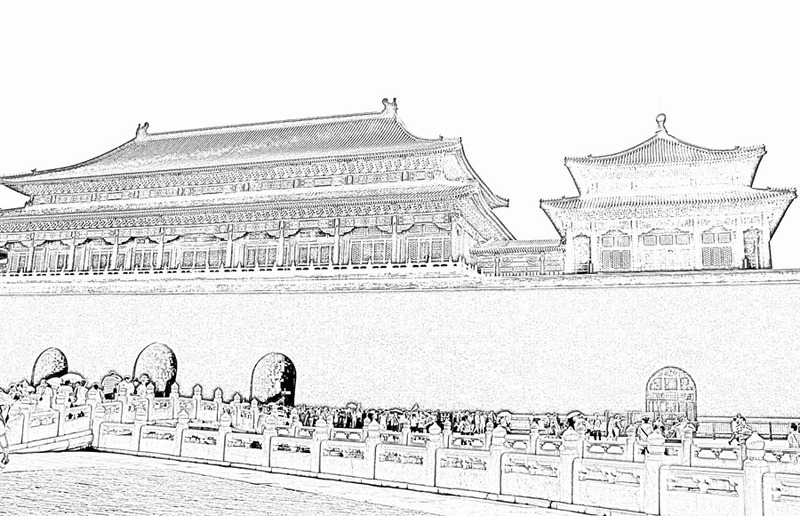 The palace area is very large and is called the Forbidden City. There are some people with umbrellas alongside the road. 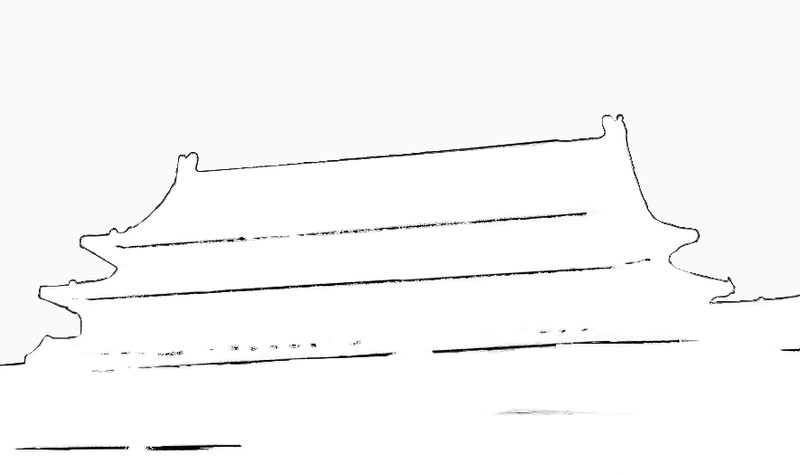 Another simple sketch of chinese style architecture. A part of the Forbidden City complex. 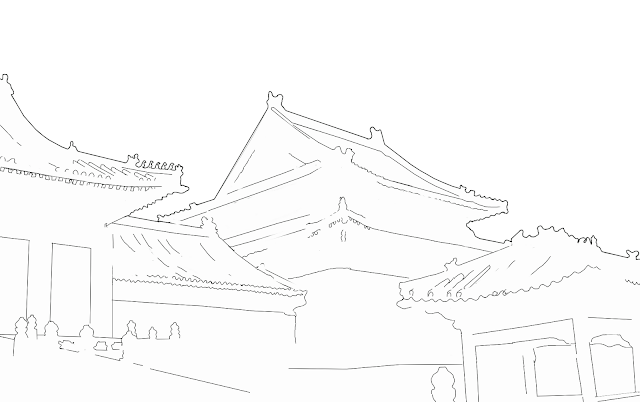 This building sketch is in one of the courtyards within courtyards of the Imperial Palace. In all of these palace structures you can see the intricate designs on the roof, doors, windows and even walls. All types of motifs are visible and bamboo and wood are used freely. The way the structures are designed, they allow the rain water to flow away. Another part of the Forbidden City with a large courtyard in front of it. 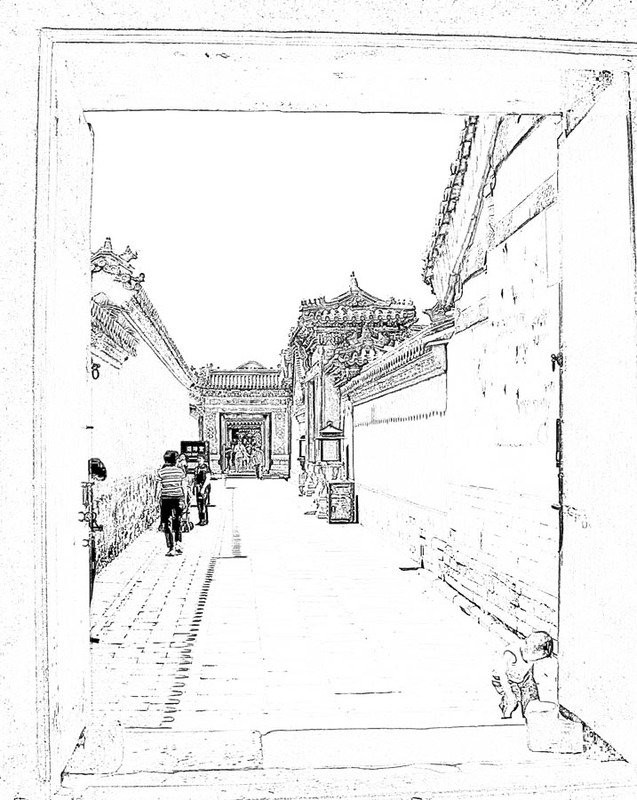 Courtyards and enclosed gardens are a common feature in ancient Chinese houses, more so of the rich. These allow for ventilation and also privacy for the inhabitants. A sketch and glimpse of some Chinese style architecture inside the Forbidden City. High walls cordon off the buildings from the outside world. Note the elaborate decorations on the roof, doors, windows and walls. A simple line drawing of a part of the Forbidden City complex. It is a long way through the huge Imperial Palace complex. There are courtyards and there are long passages with buildings on each side. Related Viewing: Chinese Architecture Sketches or check out more photographs and posts on China which have pictures of tourist attractions, Buddha temples, Chinese cities and the Chinese people. 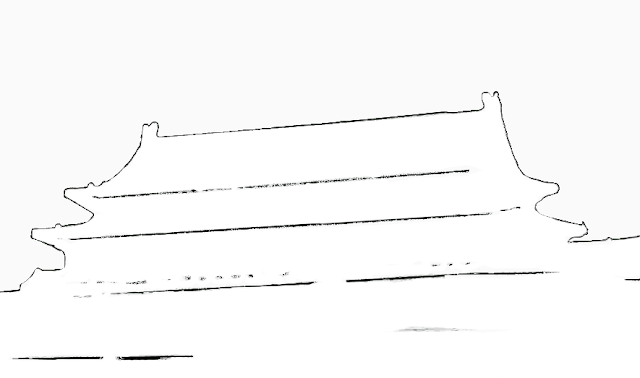 There are also pictures and sketches of skylines of Chinese cities. If you are interested in buildings then check out the label "Architecture"and here you will find sketches as well as photographs of ancient monuments, skyscrapers, high-rises and other types of buildings from different parts of the world.